EXCLUSIVE AT NET-A-PORTER.COM. Malone Souliers' cult 'Maureen' mules tap two of this season's biggest trends - animal print and the '80s. 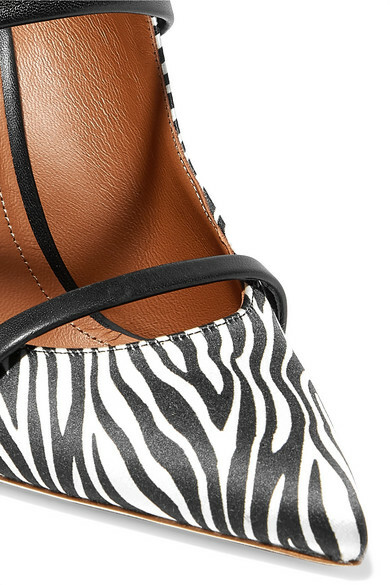 This pair has been handmade in Italy from smooth satin patterned with zebra stripes and detailed with two leather straps across the foot for a supportive fit. Wear them with a mini dress or a pair of straight-leg jeans. Shown here with: Alessandra Rich Dress, Attico Pouch, Isabel Marant Belt, Jennifer Fisher Earrings.